iBeacon is, to quote Wikipedia, an indoor positioning system that Apple calls “a new class of low-powered, low-cost transmitters that can notify nearby iOS 7 devices of their presence. The technology is not, however, restricted to iOS devices and can currently also be used with Android devices. Many people are predicting it will change retail shopping. At it’s core, the technology allows proximity sensing so, that a device can alert a user when moved from or to close proximity of a peer device. In a typical use case a “geo fence” is established around a stationary device (i.e. “beacon”) and mobile devices carried by users issue alerts when crossing the fence to either enter or exit the region. After Apple’s WWDC 2013 conference we’ve seen quite a bit of a buzz about iBeacon. Interestingly, the underlying technology is based on the Bluetooth Proximity profile specification ratified in 2011. Though a lot of the buzz has been associated with Apple, the company is not attributed as a contributor to the original specification. Also, Apple is yet to reveal what it plans to do exactly with iBeacon. A few other companies are planning to bring iBeacon compatible beacons to the market, but the beacons aren’t shipping, yet. So, if you want to start developing software right now you have to resort to other solutions. One option is to use a Bluetooth LE (BLE) capable device, equipped with the right software, as a beacon. For example BLE capable iOS devices, can act as beacons with the AirLocate application. So, if you have e.g. a new iPhone 5 to spare, you can make it into a beacon very easily. Another option is to build a beacon yourself, since iBeacons are based on standard Bluetooth LE proximity profile. A company called Radius Networks has published an article about building a beacon, so I decided to try this out. Unfortunately, Radius was using IOGEAR GBU521 Bluetooth dongle which I couldn’t find at any of the local electronics shops. USB Bluetooth dongles aren’t very expensive, however, and since there aren’t many Bluetooth chipsets on the market, I decided to experiment a bit and buy two different dongles to try out. These were the Asus USB-BT400 and TeleWell Bluetooth 4.0 LE + EDR. Some vendors sell memory cards with pre-installed OS for Raspberry Pi, but I couldn’t find one of those either at my local electronics shop, so I bought a blank memory card and a USB-based SD card reader, just in case. The SD card reader proved handy because it turned out the card didn’t work with the built-in reader on my MacBook Pro. Installing the Raspbian (2013-09-25-wheezy) Linux distribution was fairly straightforward using the instructions on Embedded Linux Wiki (RPi Easy SD Card Setup). The only notable issue was that on Mac OS X writing the OS image to the card was a lot faster (~ 4 min. vs. ~ 30 min.) using the raw disk device instead of the buffered one. Another issue was that the memory card disk had to be unmounted using diskutil, not ejecting it through Mac OS X Finder. After installing the OS image on the SD card it was time to see if the thing would boot. Unfortunately, I only had a VGA monitor and no suitable HDMI-VGA adapters , so I wasn’t able to make a console connection with the Pi. Being eager to see if everything worked so far, I decided to connect the Pi to a wireless access point and power it up. After a few moments, I noticed that RasPi had acquired an IP address from the AP’s DHCP server and I was able to log in to the Pi via SSH using the default credentials. So, no console whatsoever was required to set up the Pi! Being a Java developer, I was happy to notice that Raspbian came with a fairly recent Java Standard Edition 7 installation by default. The latest Java 8 build is also available for Raspbian. and then configuring the source and building it. I used BlueZ version 5.10, which was the latest official version at the time. After compiling the BlueZ Bluetooth protocol stack it was time to test if the Bluetooth dongles I had bought were working. Running hciconfig I noticed that the Telewell dongle was being detected, while the Asus wasn’t. During further testing it became clear that the Pi’s signal wasn’t being picked up by a demo app on an iPad. More research showed that though the TeleWell dongle did support Bluetooth 4.0 LE, it didn’t officially support the required proximity profile. After yet more googling, I found that the Asus dongle seemed to include the same Broadcom BCM20702 (A0) chipset as the IOGEAR one used by Radius Networks. However, the dongle wasn’t being detected because Asus has a vendor specific USB device ID for it that wasn’t known by the Raspbian kernel. The solution for this issue was to add the device ID in the kernel source (credit to linux-bluetooth mailing list), rebuild and install the newly built kernel. Additionally, Git had to be installed to be able to fetch the Raspberry Pi kernel source, build tools and firmware. Fortunately, I was able to produce and deploy a working kernel build and the Pi booted up with the fresh kernel. This time, hciconfig showed that the kernel and the Bluetooth stack were able to detect the Asus Bluetooth dongle. There are a couple of mobile applications available that can be used for verifying that a beacon is functioning properly. iBeacon Locate is available in Google play store for Android 4.3+ users and Beacon Toolkit in Apple App Store for iOS 7.0+ users. Both applications require that the device supports Bluetooth BLE. 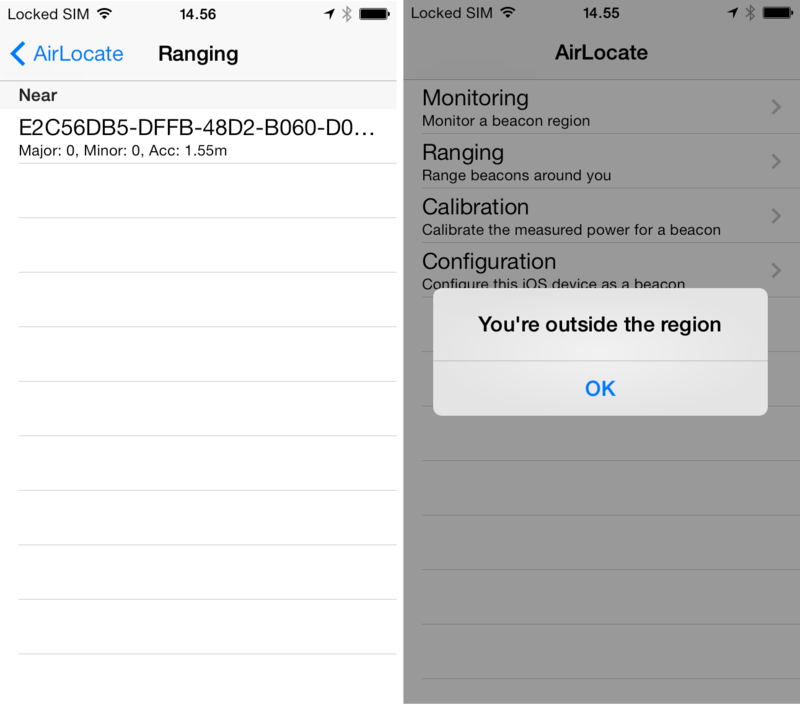 Sample code demonstrating how to read beacon signals is also available from multiple sources, including the AirLocate application, Apple WWDC 2013 and android-ibeacon-service. AirLocate e.g. is a complete sample app that you can build, modify and install on your iOS device, provided that you have an Apple iOS developer certificate. 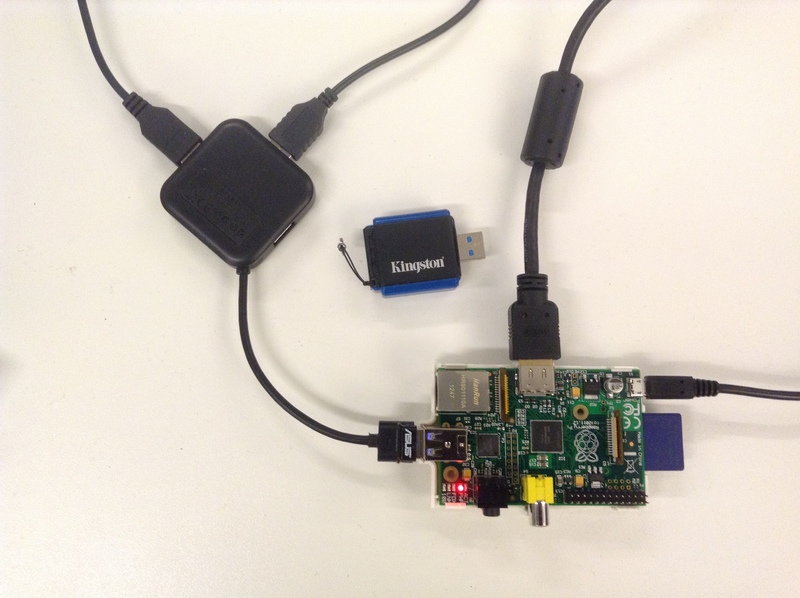 I was able to pick up the Raspberry Pi’s beacon signal using AirLocate on iOS and iBeacon Locate on Android. There were some problems with the sample apps, when I configured the beacon to use a custom device UUID instead of an Apple demo UUID: the demo apps failed to detect the beacon when using custom a UUID. A custom application was, however, able to detect the beacon also with a custom UUID. Next, I’ll have to experiment a bit more with proximity sensing accuracy, notification event delay and how different physical space topologies and interference affect proximity sensing. Also, a demo app should be developed to simulate proximity alerts in the context of a real use case. Once Pi beacon was running fine, the last thing was to make the beacon automatically turn on at boot. For this I studied the existing init scripts to learn what kind of metadata is required to be able to manage the “service” using update-rc.d command. I also separated the configuration parameters in a separate file (/etc/default/ibeacon.conf) from the init script. iBeacon is based on standard Bluetooth 4.0 LE proximity profile that is not Apple proprietary technology. The technology works currently on newer iOS and Android devices, and these operating systems include APIs required to detect beacon signals. iBeacon has many interesting use cases for indoor positioning, including but not limited to, retail shopping and analytics. It’s still an emerging technology and I’m sure we’ll see it applied in many unexpected contexts in the future. With the high end embedded platforms, such as the Raspberry Pi, similar tools and techniques can be used for developing software on both platforms, so from a development and maintenance point of view these platforms are converging. This creates fascinating opportunities for software developers who don’t have a traditional embedded development skill set.